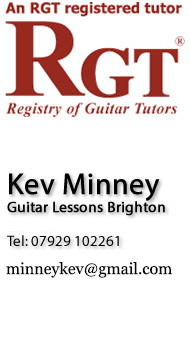 Welcome to my website, I offer Professional one to one Guitar lessons in Brighton and Hove, I teach from my home studio based in Brighton. I teach beginners, intermediate and advanced level players. With over 10 years teaching experience I can offer you the best guitar tuition which is tailored for you. If you wish to learn electric or acoustic, bass or Classical Guitar, I can provide you with the right methods to get YOU playing. Whether it’s simple songs or all out rock guitar solos, I can show you the best and the right approach for you. I also offer nationally recognised guitar grades (RGT). The RGT Grades I teach are the most widely recognised and will help you become a knowledgeable and professional guitar player, and can even gain you UCAS Points. I have taught over 1,000 students Guitar grades, my students have achieved 100% grade pass rate.